Dang...... Please, let them find Jim OK.
That's terrible. I hate hearing that news. I hope and pray that there will be some good news today. I really cant take this right now. When is 2006 going to be over with? Jim, we really love you, wherever you might be. We really, really love you. I just hope he's huddled up on the bank, somewhere. Erickson... cut this out, man. You are killing us. Here's one of those "famous" hugs you used to always ask for. How I wish I could give you one, right now. for good news and soon! We fished the NF and as we were leaving this afternoon around 4 there was quite a bunch of sheriffs staging at the hatchery, they had a few rafts and looked like they were going to be doing a rescue. Man, this is bad news this man is the king of the N.F. I do not know any more than what has been said. I will post as soon as I know more. I have had several emails asking. The last word I got, it did not look good, but damm that Jim, you never know. He might be seating on the bank some where trying to decide what kind of a story to tell us. You can bet it will be a g ood one. If he does not make it, you can bet he will have a hell of a story to tell St. Peter at the golden gates. Were with you Jim. I dont know the guy but oh I hope all is ok! What a terrible thing to happen on a fun fishing trip. Why thats why god made flashlights! This is sad news,only met Jim once but he was a pleasure to chat with that day. If the MAN is listening...Please...This is one of the Good ones!! !....prayers go out to his family and friends. Last edited by First Light Bite; 12-28-2006 at 05:24 PM. The guy with Jim, made it to shore and is ok. I sure hope he was wearing a life jacket. How far down the river was he? Would it help if we went and helped look for him? Happiness is a large gut pile! Sincerly hope he is alive and well............ I think he is just too onery to not survive and tell us about the fish he caught while waiting for a ride down the creek. No matter what happens when my time comes I hope I go out on my favorite river doing what I enjoy most. I am not a very religious person, but tonight I will say a prayer. I to was on the NFN today. I saw Jim float by about 10 am. I told him to have a great day. He said were going to. That the last I word he said to me. Jim's been floating that river for many years now. Last edited by Pete; 12-28-2006 at 06:30 PM. Reason: Please avoid rumors and speculation. He might be seating on the bank some where trying to decide what kind of a story to tell us. You can bet it will be a good one. If he does not make it, you can bet he will have a hell of a story to tell St. Peter at the golden gates. Jerry is exactly right on this one. St. Peter better have a pot of coffee ready if Jim shows up there because it will be a long night! If anyone can make it out of that river, it is Jim. He know just about every rock in that river and has even helped a few through Jim's "inconvenient rock relocation program" which is similar to his work at cultivating the streamside trees and vegetation. We're rooting for you Jim. He's probabliy lashing some logs together so that he can finish the drift and get first water in the morning. Flipping your boat is a very unfortunate event. 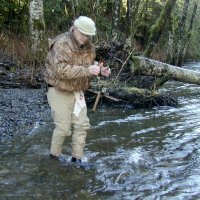 Jim, as President of the North Fork Nehalem chapter of the Northwest Steelheaders, is one of our valued members and a survivor. We ask all of you to please be safe on your angling adventures and we look forward to sitting at the table with Jim once again. 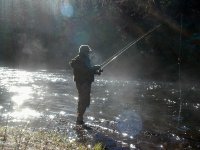 The Association of Northwest Steelheaders, is a 501c3 non-profit. Our mission is "Anglers dedicated to enhancing and protecting fisheries and their habitats for today and the future"
If anyone can survive this, it's Jim. We look forward to hearing good news tomorrow..
We are both casting a long prayer line for you over here. Even at just 8 yrs old, my daughter understands fully that finishing your life out, doing what you love, where you love, is so very important. I don't know Jim, but with all of these great things everyone has to say about him it sounds like he is a heck of a wonderful guy. My thoughts and prayers will be with him and his family tonight. I hope he is found safe. "If God did not want us to eat animals He would not have made them out of meat!!" i will pray for him to be found safe. The following is something from Jennies online journal from Jan 7th, 2003. Last edited by drhall99; 12-28-2006 at 08:05 PM. This is horrible news........ Only a guy like Jim could pull this off. I had the honor of meeting him in the 80's and have respected him greatly ever since. Sad news indeed. I will say a prayer tonight for his safe return. Ironically, Fishing the West will be re-airing the episode featuring Jim from 1993 on December 31st. I do not know him but he sounds like a great guy We hop for the best. I have been watching this thread off and on for close to 5 hours hoping it isn't true and it will go away. I'm sitting here in my office looking at a hand sketched Jim Erickson map of the river he loved. Each hole numbered in the Erickson system as to how productive the water is and where to fish it. A personal treasure ! God be with you tonight Jim. It seems he may have found repose in his element. I do not know Jim but it sounds like this man is loved and admired by many, I do hope all the best for him and anyone else involved. I have never been on that river, was just trying to understand why a search would be called off , This is absolutely in no way a flame at anyone trying to find him, as i do understand sometimes cercomstances will not allow a search to take place. I am just unfamiliar with the river involved. I sure hate seeing situations like this arise. I hope he is ok. If it were my buddies locally here, we'd have cox's army out looking for him regardless of the river. Why would they call the search off? That doesn't make sense? It will be down near freezing tonight? Last edited by stlhdr1; 12-28-2006 at 09:55 PM. The area that Jim floats is no place to be floating or searching after dark. It is a very tough river and it wouldn't help to turn the searchers into victims by putting them in harms way. Last edited by drhall99; 12-28-2006 at 10:09 PM. The news just reported that one made it to shore and the other is still missing, the missing person is in his 70s. Hope he is ok also. I count myself among those lucky enough to take a ride with Jim, and listen to his stories. I too treasure the homemade maps I have. As a techno geek, Jim made fun of my GPS on the trip, but he took the time to tell me when to save a really good spot on the GPS. I pray Jim is OK out of this. Last edited by Riverbankslayer; 12-29-2006 at 03:27 AM. Our hearts and prayers go out to Jim and his family and friends. Never give up hope! I can totally relate to posting at 4 in the morning, Bill. I've been up all night, despite tons of surgical pills and being put clear to sleep yesterday. I am writing blind, so please excuse. If the search was called off, I most certainly promise you that Mark, his son and the rest of the gang were out all night looking. Anyhow... Oh, poor Loretta. Poor family... Poor little Christie. I just feel sick for all of his loved friends. Jim was the absolute crustiest. He waas grough, and did plenty to upset me at times, but overriding all of that was the deepest love for a man with an absolute heart of gold and a kindness not many of us are familiar with, or can come close to. Tender, underneath... When Loretta was sick, it was the first time I'd truly seen that side of him quite so strong. He was an absolute sweetheart. The love between Loretta and Jim is something we should all strive for. If it hadn't been for my surgery, Bill and I both would have been in that boat. I don't know how to feel about that. so many thoughts running through my head. Jim woudl come pick me up in Astoria and take me to breakfast in Longview on rainy days. He loved driving, taking long drives on stormy days. He loved to hunt rats and he and Loretta would go for days, living out of the back of the crummy. The stories they'd tell at the end, were great. Back in the old days they had crummies to pick up the loggers. That's where the name. 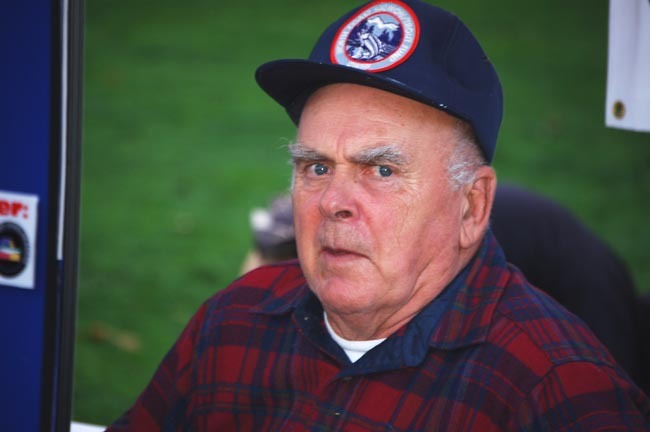 His son is a logger. Anyhow... I'd take them nice dinners when they were ill, and Loretta never missed a thank you card, hand written, including stories of the important things in life. Trip pod the dog, (Who recently passed) her flowers and vegatables, and her county fair entries. Jim would send me weekly updates and pictures of his family and fun. I loved Jim's letters. Totally mispelled due to his beloved speech writing program. He refused to better his typing, despite my giving him a learn to type CD. Two days ago, Bill spoke to him on the phone. I had upgraded my life jacket to a Mustang, and offered to gift him my older self pull Stearns. It's a great life jacket, and I think it would have better suited his needs than those uncomfortable ones. Two weeks ago, Bill and I were full of concern, because we called Jim at dinner time. Someone answered, and dropped the phone, and never answered. We were so concerned! We finally got ahold of him. Jim would call every morning at 6-7. I was mostly too busy at the time, with ifish to chat with him like I used to. But, a week ago, I called him and spent an hour on the phone, just catching up. Bill usually takes the calls, lately. He also ccalls at 6 at night. He's fondly known by the kids and Bill and I, when it rings, as "There's dinner time Jim!" It's a no brainer that when the phone rings at that time, that it's Jim. We've scolded him, made fun of him, constantly asked him not to call at dinner, but for years, he always did. We didn't complain, and dropped our forks to laugh with him, to visit. I'm so glad we did. Jim, I really love you. Loretta, we are with you and promise to do anything for you, at any time. To the rest of the family, let me know if I have anything from Jim that you want, need. Jim gave me my very first real steelhead rod and I treasure it to this day. 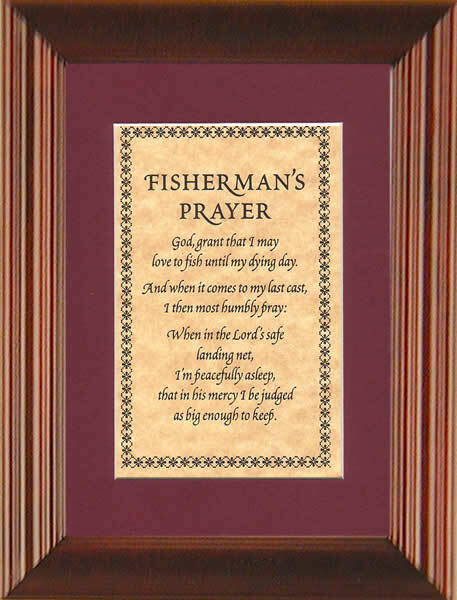 He was the first fishermen that I got to know that was a well known fisherman and I was so honored to have met him, through Milton Fisher. Milton took me down the NF twice, and then turned me over to Jim for future trips. Oh, how I loved them both. Now, I have no desire to go down the NF. I couldn't take it. Milton was hard enough and I haven't been since then. Now Jim. Oh crud. My eye is so sore. Tears are so salty, and my eye pad to protect it, with the shield is just soaked to the bone and stinging. Oh, man. Life... getting older... is certainly not for wimps. Hope you can read this-- or maybe not. it's just personal ramlings. JIm is a legend! I'll never forget his willingness to help out when the fishing was slow and my learning curve was going up on Nehalem Bay. He would just troll alongside and tutor. One of the really good guys. Jim knows that river as well if not better than any man. Hopefully he was given the chance to make it to shore. If so he will have a story that will be remembered for life. Our Prayers are with you Jim. If jim had a problem going down the Northfork be advised to think twice about it right now before you try it. Does anybody know where they went down?? The Devil made me do it the first time. The second time I done it on my own. This is indeed not the kind of news a person wants to here. I grew up in Manzanita and went to school with his two sons. I remember calling him Dr. Erickson back in the 70's. My prayers and my family's prayers are with him today. I hope it all turns out well. A friend was with them in another raft...the guy who bought Jim's place...he left a message last night that he did not make it. Tim said it was new from the last high water. They were going to look again today but it sure sounds bad. Very sad deal...hope they're wrong. I was with Jim yesterday, with my brother Tim Gray who lives in Beaverton, my other brother Scott and my son Brendan. We were drifting the river in two rafts. My brother Scott was with Jim ahead of us. A newly fallen tree was submerged in some rapids just below the hatchery. 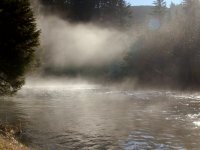 There was a lot of mist, and the sun glare was directly in our eyes as we approached the log in our raft. We saw some tree shoots sticking up out of the water, but the log was stretched out across about 2/3's of the river, just below a water curl though. Our raft go stuck on it but was pointed down river. We rocked off. Jim's raft got stuck sideways. As they tried to get it off the log and pointed in the right direction, the rapids flipped the raft over, and it ended up on top of Jim and my brother. It all happened very quickly and suddenly. They had a difficult time getting out from underneath the raft. The rapids swept them downstream. My brother came up once, and saw Jim floating by, his hat and eyes above the surface and his boots were up. There was no movement, and my brother could not tell if he was alive at that point and trying to ride the rapids out, or already gone. My brother could not get to him in the rapids. My brother was swept downstream about 300-400 yards, only surfacing once or twice during that time. While still completely submerged, he grabbed the outstretch limb of a tree, and held on, eventually pulling himself to shore. We found him on shore when we passed by, wet and disoriented. We got him in the boat, and got him covered with dry clothing on his upper body. We then looked for Jim as we traveled down the river. We found his raft flipped over, and some of the gear, but Jim was no where to be found, sadly. We spoke to some guys down river. A couple of sheriffs showed up, and eventually more search and rescue resources came, along with a Coast Guard chooper. They called off the search when it got dark. They're apparently resuming today, with divers. Finding him will be a sad formality at this point.